Brighton does it again, mixing international flair with local fare as its August Food & Drink Festival hits the town. Perennial favourite Sussex & The World Market with its 100-odd stalls pitches camp on Hove Lawns throughout the Bank Holiday weekend, with the debut of the Sussex Drinks Tent. From noon until 8pm on Saturday and Sunday, KingBeer & The Collective are running a craft beer and lager bar, Butlers Wine Cellar is pouring English wines, and Blackdown is in charge of the Sussex G&Ts. Cider takes on wine for the second time, with you, the diners deciding its fate. 18 months ago – was it really that long? – Mitch Adams and I brought you the world’s first Cider vs Wine food matching tournament, at his then pub, The Thatchers Arms near Colchester. A sell-out, with cracking examples from both camps – read more about it here – it’s taken until now for the return match. And now that Mitch is running The Bull in north London, a wonderful foodie, friendly pub in Highgate, it’s taking place in his cosy rooms upstairs. What happens when you cross a heritage-fuelled brewery, Harveys, with the chef from a restaurant less than a year old, in this case 64 Degrees? Or world class sparkling winemakers Ridgeview with the man behind the stove at heat-infused eaterie, The Chilli Pickle? Be among the first to taste the results of these unusual alliances at Brighton & Hove Food & Drink Festival’s newest event, Food Lab, on Sunday 14 September. From Beavertown to Siren, Camden Town to Weird Beard, Sierra Nevada to Evil Twin, London Craft Beer Festival heads to the Oval in East London from 14-17 August. Taking an all-in approach, your £35 ticket fee entitles you to small pours of all the beers on offer, plus four bigger pours (third pints), and some great music. It’s a wonderful environment to taste the brews, meet the creators, enjoy tasty eats on the terrace, and generally enjoy the vibe – Craig Charles was playing when we went last year. Scotland’s oldest micro-brewery hosts a new beer and food festival on the first weekend in August. Beyond Beer at Traquair House brings together breweries from the Border with guest brews from across the land and a host of local food producers. Traquair’s superlative Jacobite Ale will be there alongside brews from Broughton, Borders, Tempest and newbie, The Freewheelin Brewery Co, while Whitmuir Organis and Cocoa Black Chocolate will be running some of the food stalls. Who has tried Okell's beers? If you have, this is a steal, and if you haven’t, it’s going to be even more fun. The Bull at Highgate is hosting a special dinner on Thursday 31 July to showcase not just the beers but some of the Isle of Man’s fine ingredients, including its renowned Queenie Scallops and its Loaghton sheep. Do you know Brighton's best pub? Hurry, hurry, hurry – there’s less than a week to go until public voting for the Brighton & Hove Food & Drink Festival Awards closes on 30 June. And I need your help in particular. I’m delighted to be judging the Pub of the Year award with Bob Trimm from Harveys, so I need you to ensure all the best Brighton & Hove pubs are in the running. It’s easy to do. Just head to the website and nominate your favourite place. 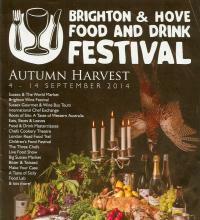 Not long now until Brighton & Hove kick off their Autumnal celebrations of all that's fun in food and drink. And you can join in. Whether it's fab ales, tasty ciders, new age gin or serious sparklers, the Festival helps you get to taste some of the region's finest produce. Always fun, always tasty, below are a few of my highlights. To catch up with all the events, head to the comprehensive Brighton & Hove Food Festival website to see what takes your fancy. What’s better than chocolate? How about beer and chocolate? Yes, it’s that time of year when not one but two of life's luxuries – nay, necessities – come together in one package. Dea Latis is the inspiring pan-industry group of women who love beer, and want to share their enthusiasm, particularly with anyone new to the (not always) amber nectar. 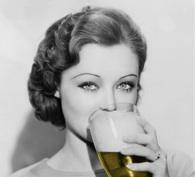 It is holding its annual beer and chocolate tasting on 25 March in London, and all women are welcome. Still got a few gifits to buy? Here's a few suggestions of presents you can sort out with the click of a button.